It's the week of Halloween so it makes sense to put together a quick list of great villains. Your favorite will certainly be left out so please feel free to add yours to the comments section below. This list is by no means complete or comprehensive, we at the office wanted to pick 5 good ones who have established archetypes, push boundaries, created genres or whose actions are so chilling that the reader had to set the book down and wash their hands because they felt icky. 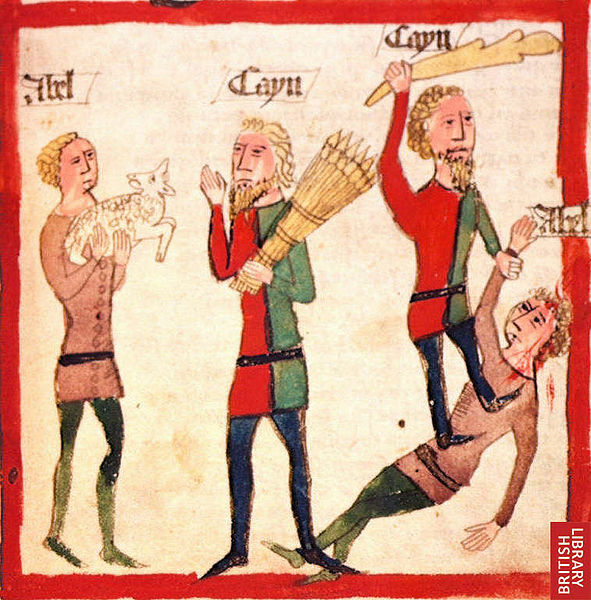 The original biblical bad guy, Cain or in Hebrew Qayin, was the first naturally born human and his brother Abel was the first human to die. Cain slew his younger brother in a field. The motives for the killing have been debated for centuries, the popular theory attributes his murdering his brother to jealousy, one of the seven deadly sins. The Bible itself provides very little in terms of context. This is the first murder according to Abrahamic Theology, and the motive of jealousy has been used by writers for millenia as a basic driving force in an antagonists life. For these reasons Cain made our list. This is not the lumbering hulk created by Boris Karloff in the 1930's. Mary Shelley's genre creating masterwork contains a villain who is articulate, clever and unstoppable. The Monster, whose name is Adam, is created from reanimated corpses by Victor Frankenstein. Victor's dream is to conquer death and instead he unleashes it on all of his friends and family. Adam is highly intelligent. He learns to speak and read all on his own while hiding from various bands of torch wielding villagers. Most people get depressed due to angry villager pursuit. Not Adam, instead he reads a little Milton and Plutarch to pass the time. Despite being well read, articulate and a good center for any intramural basketball team, Adam is continually harassed and attacked by the aforementioned villagers with torches. He swears vengeance on his creator and sets about a terrible path of revenge. Adam systematically murders all of Victor's friends and family. The Monster kills Victor's younger brother and frames an innocent man for the crime, who is later hanged. He strangles Victor's wife Elizabeth to death on her wedding night. I will revenge my injuries; if I cannot inspire love, I will cause fear, and chiefly toward you my arch-enemy, because my creator, do I swear inextinguishable hatred"
He toys with poor Victor like a cat with a vole, always one step ahead of the poor deranged man. Victor dies alone on an ice floe in the Arctic. Only then does Adam build him a funeral pyre and set himself on fire, killing himself while his creator burns. This chilling story, which was told first on a rainy day in Switzerland for a bet, created the modern genres of Horror and Science Fiction. The Monster is empathetic to the reader despite his horrifying deeds and certainly deserves a place in our Halloween top five. There are so many of Shakespeare's villians to pull from, and a list of ten of the Bard's baddies is sure to be on the way, but for now make due with Iago, from the great tragedy Othello. Iago is an improvising malevolent force, who runs a path of destruction through the entire play. What makes Iago so powerful as a villian is that he seems to have no motive. There are elements of jealousy and vengeance as well as wrath and greed, but none of these really feel like the true motive. He is an element of chaos. Iago plants seeds in Othello's brain, he tells long and poetic tales of Othello's wife Desdemona sleeping with Cassio, a handsome lieutenant under Othello's command. Iago's plan kills four innocent people: Othello, Desdemona, Emilia and Rodrigo, also Cassio is castrated in a violent attack. Iago survives the play and never reveals his true motivation to anyone. A personal favorite of mine the sorceress Medea comes to us from Greek mythology. Medea saved and married the Greek hero Jason. She was instrumental in Jason capturing the Golden Fleece. They later married and had two sons. Hell hath no fury like a woman scorned. Medea was scorned. After years of happy marriage, Jason is presented with the opportunity to marry the young and pretty daughter of the King of Corinth, Glauce. Jason may be a hero and good with a sword, but he is also pretty dense. He turns his back on his sorceress wife, who already killed her own father and brother out of her love for Jason. He tells her to pack up and go. You can't take the kids, we're done. Kick rocks. Medea does not take this well. She first considers killing herself, but that's to difficult for her; so she does the following instead. Medea acts as if everything is alright and that she accepts Jason's decision. She makes a lovely new dress for Glauce. Glauce, who is about as bright as Jason, gladly accepts the new dress and puts it on. The dress erupts in flames. The King of Corinth, seeing his daughter spontaneously combust, attempts to put her out, and dies a horrible flame related death as well. This all told to Jason through messengers in Euripidies' tragedy. All of the terrible action is left to the audiences imagination. Except for this. The following action is only heard but never seen. A child within: What shall I do? What is it? Keep me fast from mother! The other child: I know nothing brother. Brother! Oh, I think she means to kill us. A child: Yes, in god's name! Help quickly ere we die! The other child: She has almost caught me now! She has a sword! She cuts down her two sons with a sword to punish Jason for his dalliances. Medea erupts triumphant above a broken and weeping Jason in a chariot pulled by dragons. She condemns him to a long miserable life. Medea: Thy marriage drive Medea from this land, and suffer not. Call me what thou please, Tigress or Scylla of the from the Tuscan seas: My claws have gripped thine heart, and all things shine. Jason: Thou too hast grief. Thy pain is fierce as mine. Medea: I love the pain, so thou shalt laugh no more. This play is over 2,500 years old and it holds up. Few actions are as terrible as a mother killing her own children. The fact that Medea gets away with the crime, leaving Jason a broken wretch is all the better. It is available for free on kindle and is well worth a read. That's right! The Clown Prince of Crime and the original Batman nemesis, The Joker. He appeared in Batman number 1 on April 25th 1940. He was created by Bob Kane, Bill Finger and Jerry Robinson. 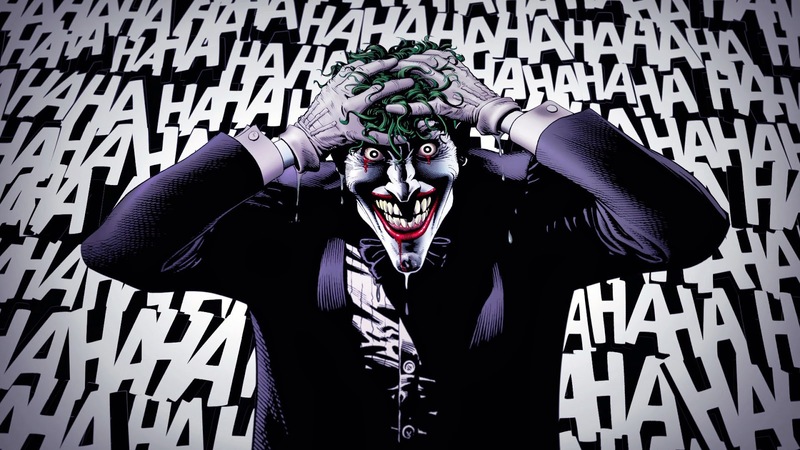 Reams have been written about the Joker, he has gone though a plethora of versions throughout the ages: trickster, thief, gangster, artist, anarchist and monster. He is arguably the greatest fictional villain of the 20th Century. Stan Lee has often stated that what makes a hero truly great is the quality of the villains the hero must face. This is no more true than with the Joker and Batman. The Joker is constantly pushing to break Batman's ironclad code: No Killing. The Joker kills without thought or remorse. If you look at Batman from a Neitzschean perspective, The Joker is the dragon to battle, however to truly defeat the dragon the hero will become a dragon themselves. Translation: Batman must violate his own code in order to win, which will then destroy all that he represents. Quite the paradox. Ladies and Gentlemen! You've read about it in the papers! Now witness, before your very eyes, that most rare and tragic of nature's mistakes! I give you: the average man. Physically unremarkable, it instead possesses a deformed set of values. Notice the hideously bloated sense of humanity's importance. Also note the club-footed social conscience and the withered optimism. It's certainly not for the squeamish, is it? Most repulsive of all, are its frail and useless notions of order and sanity. If too much weight is placed upon them... they snap. How does it live, I hear you ask? How does this poor pathetic specimen survive in today's harsh and irrational environment? I'm afraid the sad answer is, "Not very well." Faced with the inescapable fact that human existence is mad, random, and pointless, one in eight of them crack up and go stark slavering buggo! Who can blame them? In a world as psychotic as this... any other response would be crazy! The Joker is our only modern name on the list and certainly can stand to represent the most violent century in human history.